The holiday season is here so what better way to celebrate than to throw a party! 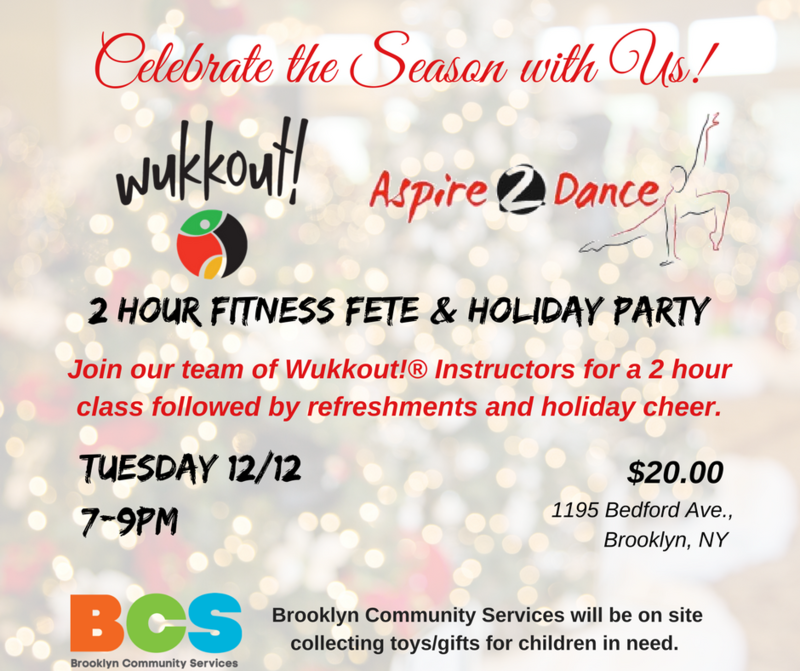 Join Wukkout!® and Aspire 2 Dance as we celebrate the season with a 2 hour Wukkout!® class and holiday party. Come get your double dose of Wukkout!® with Founder, Krista Martins, alongside Wukkout!® Instructors, Tyrone, Kim and Ariana. Wukkout!® Wear will be available for purchase and after class, stay and join us for holiday treats, refreshments and cocktails, as we toast to the year ahead. Lastly, but certainly not least, we are joining forces with Brooklyn Community Services to host a toy/gift drive for children in need. BCS will be on site collecting toys/gifts and we appreciate anything you are able to give. "The mission of Brooklyn Community Services (BCS) is to empower at-risk children, youth and families, and adults with mental illness or developmental disabilities to overcome the obstacles they face, as we strive to ensure opportunity for all to learn, grow and contribute to ONE Brooklyn Community." Sign Up: No pre-registration necessary. Simply show up and pay at the door. This is our final class of the year at Aspire 2 Dance. Our regular one hour classes will resume Tuesday January 9th. ** In the meantime, come celebrate the end of our season with us and please tell a friend to tell a friend. Feel free to contact us with any questions and remember to bring a bottle of water, your rag (because you will sweat) and your flag! Check out the video above of our most recent 2 hour class held in Manhattan. Thank you to Mister LiViz for the footage. **Please note that beginning in 2018, there will be a small price increase for our regular classes. The drop-in rate will now be $15 and packages of 4 classes will increase to $45. Additionally, if you purchase all 7 weeks of the winter session in advance, you pay only $75.00. (Anyone previously purchased class packages will continue to be honored). We appreciate your understanding and look forward to continuing to have you in class in the new year.